Courses available in the game development & entrepreneurship program will provide you with the opportunity to acquire the knowledge and develop the skills required to quickly advance your career. 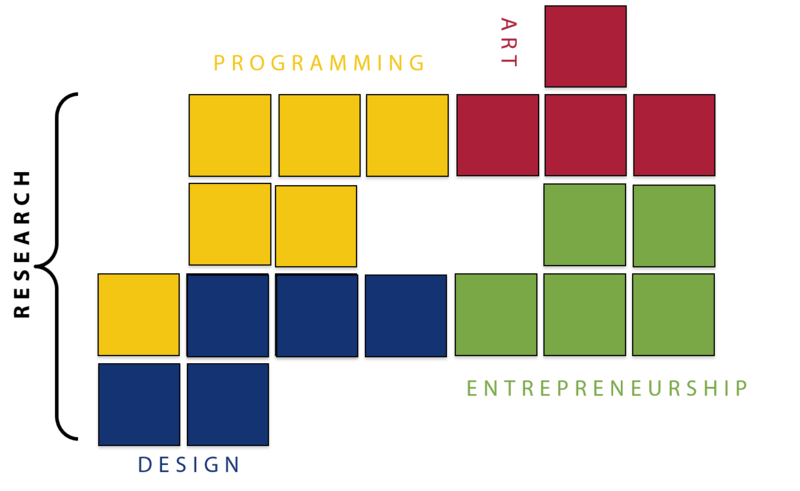 Courses are grouped in four main areas: including programming, art, design, and entrepreneurship. Each area is supported by the faculty through their teaching and research experience. Here are some of the courses associated with all areas of Game Development. For the full list, please refer to the Program Maps Section. For specific information on the current catalogue, please visit the Game Development and Entrepreneurship Calendar. This course will introduce you to the basic concepts in game design. You will be introduced to rapid iteration techniques and the non-digital design of board games to paper-prototype your game mechanics. Learn how to design basic board, card, dice and digital games and gain practice in designing game mechanics. This course will introduce you to the basic mathematical concepts you will need to be an effective game programmer, designer, producer or artist. You will explore linear algebra concepts as well as discrete math concepts and how they relate to game development. This course introduces you to general computer programming principles, logics and problem solving skills. Topics include data types, variables, operators, expression, statements, blocks, control flow statements, functions (routines), arrays, pointers, and basic concepts of structures. The course uses a programming language such as C or C++ for illustrating the principle programming concepts. This course introduces entrepreneurship as a discipline. In your studies , you will cover all facets of entrepreneurship, including economics, society and intrapreneuring, You will also cover issues such as starting and managing a successful new business venture, including new venture capital, creation, and management. This course introduces you to the concepts underlying computer animation and provides a solid basis of animation concepts for game development. Topics include traditional animation techniques, spline animation, interpolation and advanced level contents focusing on theoretical aspects of animation development. This course introduces the concepts behind game design and production. Topics include story versus narrative, character development, design documentation, idea formation, prototyping and the game production pipeline. Students will be required to utilize an existing game engine to develop a prototype. This course introduces the fundamental knowledge of colour and light covering the various processes on how colour images are captured and recorded in chemical and digital imaging systems. You will learn ways to manipulate various project components in the production and post-production process using an imaging system. This course will help you develop an understanding of the methods appropriate to research in colour imaging. You will study methods for image acquisition and reproduction in the context of production systems. The basic concepts, tools and techniques of computer graphics are described, and the fundamental transformations of scaling, translation, rotation, windowing, hidden line removal, image processing and clipping are presented. Mathematical tools needed for the geometrical aspects of computer graphics are discussed. Particular emphasis will be placed on new developments in microcomputer graphics. You will be expected to develop a graphics application using either C++ and/or other programming language with available graphics libraries. This course is an introduction to creation of 3D art assets using computer graphics (CG) software and the consumption of those assets in games. The course will introduce students to CG software similar to Autodesk Maya to create and animate art assets for their games with a technical-art focus. The art to engine pipeline will be introduced where the students will integrate the assets created in existing games and game engines and develop an efficient art-to-engine pipeline. This course focuses on Information Technology (IT) and game development projects. The idea is to get you familiarized with the basic project management theories relevant to your projects. It introduces the concepts and tools that pertain to the phases of the project life cycle. In particular, the course will present contrast between IT and game development. This course is an introduction to digital sound and audio concepts and their applications in multimedia production. It introduces you to the concepts of programming with sound and audio data. Throughout the course you will apply the theoretical concepts in gaming related programming projects. This course presents an overview of gitter, dither and word lengths, high sample rates, distortion, headroom, monitor calibration, metering, depth perception, compression and expansion, equipment interconnection and other digital audio related topics. Game engine design focuses on providing the tools and skills to develop extensible software that allows further expansion of the capabilities of current consumer-level game engines. Tool creation takes a front seat to allow the creation of plugins for integrating sound, animations, physics, human interface devices, assets and more, to increase the flexibility of your engine towards developing a game. Network history and architectures; reference Model for Open Systems Interconnection (OSI): descriptions, examples, and applications; routing, multicast deliver; TCP/IP protocol suite; network topologies (ring, bus, tree, star, mesh); local area networks, WAN, wireless networks, the Internet: P2P networking, distributed computing models. Understanding usability and user research in game design is a topic of growing interest to game developers. This course provides an introduction to basic and advanced user research methods as well as a comprehensive review of usability and user research issues and approaches specific to video game development. This course examines how individual entrepreneurs, companies and capital providers manage the entrepreneurial process and its financial aspects. The course analyzes a wide range of business models and suggests a variety of solutions to overcome financing and valuation challenges. The course does not only focus on valuation and the analysis of financial challenges that arise over the life cycle of the entrepreneurial venture, but also on the analysis of the people and business models of entrepreneurial ventures. This course builds on more advanced concepts in 3D art assets using computer graphics (CG) software and the consumption of the assets in games. The concepts will include high poly modelling, mesh retopolization (for use in games), camera control and importing complex scenes in game engines. You will improve the art-to-engine pipeline by developing tools in the CG software and existing game engines by developing scripts and plugins. You will also learn efficient ways of converting the shaders in the CG software for use in-game and optimize you assets when importing to game engines. Virtual reality is a very powerful and compelling computer application by which humans interact with computer-generated environments in a way that mimics real life and engages various senses. This course provides an overview of current virtual reality technology, its applications and presentings an analysis of the engineering, scientific and functional aspects of virtual reality systems. You will also learn the fundamentals of virtual reality modelling and programming. This course introduces key AI game programming issues and provides ideas and techniques to be integrated into game development. It also presents an overview of AI architecture, rule based systems, level of detail AI and script language issues, expert systems, fuzzy logic, neural networks and genetic algorithms.